Canada's legalization of recreational marijuana-use next month is not going to produce the 'high' that investors think, CNBC's Jim Cramer warns. Cramer says there's nothing in terms of company fundamentals or industry trends to justify the dizzying moves in pot stocks this week. Investors piling into pot stocks this week are making a huge mistake, CNBC's Jim Cramer warned on Friday. Shares of marijuana companies have been booming recently, in the run-up to Canada's legalization of recreational-use on October 17. But Cramer, the host of "Mad Money," said next month will instead be a "sobering moment" for pot stocks. "October 17 is not going to produce the 'high' so to speak that people think," Cramer said on "Squawk Box." "I don't want people to get hurt." Cramer said Thursday there's nothing in terms of company fundamentals or industry trends to justify the dizzying moves in pot stocks this week. The promise of the marijuana industry cannot compare to what the internet had to offer during the 1990s dot-com boom and bust, Cramer said Thursday on CNBC. "But the investors [now] are trading like the dot-com." Brendan Kennedy, CEO of Canadian pot company Tilray, told Cramer on Tuesday that global pharmaceuticals must think about partnering with cannabis producers as a "hedge" against the burgeoning marijuana industry. On Thursday, Cramer stressed Kennedy, during the interview, was not being promotional or trying to talk up the stock. 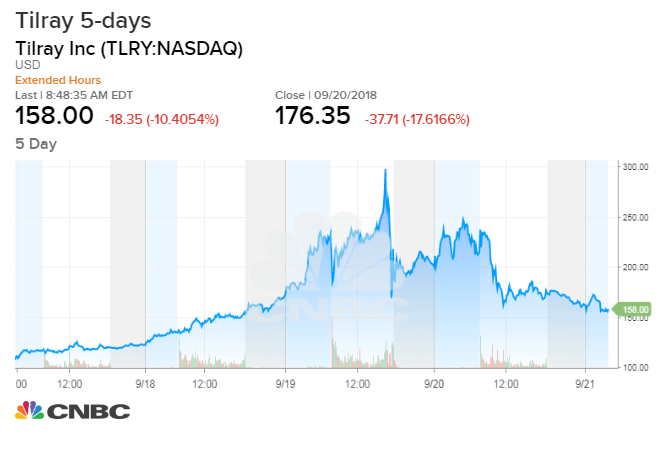 Shares of Tilray, which have been captivating Wall Street this week, had another roller-coaster ride Thursday, eventually closing down more than 17 percent. Tilray was under severe pressure in premarket trading on Friday and opened 20 percent lower. Tilray, a Canada-based cultivator that markets, develops and distributes marijuana products, aims to be "a global company" that "dominates part of [the] $150 billion industry."